Once upon a time, these used to be called fairy cakes, but now cupcakes seem to be a craze that is sweeping the nation. They range from simple sponge and butter cream cakes, to amazingly intricate creations for every occasion possible. I have never been too good at the “fiddly” stuff, so my recipes are fairly simple to make , but effective non the less. General equipment tends to be a 12 hole muffin tin, muffin/cupcake cases and and an icing set. 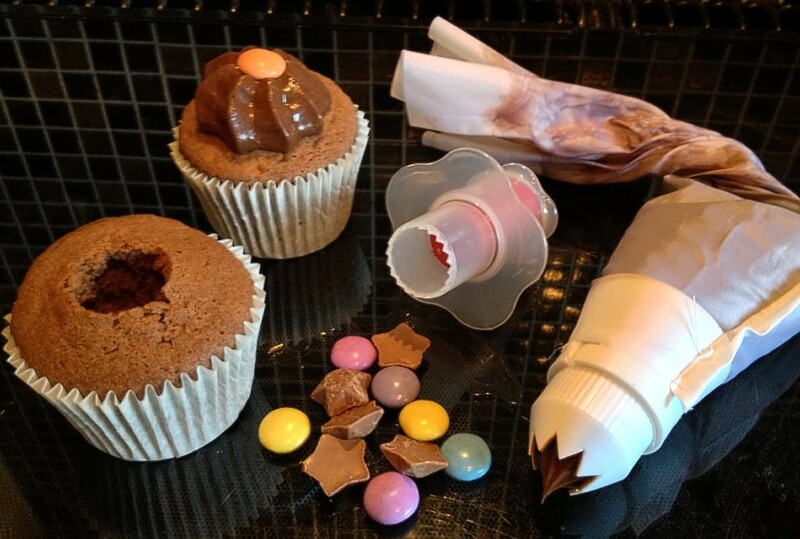 However, I have discovered some bits that add a little extra to your cupcake decor. The item in the middle is a cupcake corer, which takes out about an inch in depth from the middle of your cake. This gives you the chance to fill it with chocolates, sweets or butter cream. Alternatively I have seen recipes use the corer to cut a small circle out of fruit and insert that, before icing over with the top decoration.